Our vinyl is machine cut and adheres to many different surfaces including glass, wood, plastic and metal. It's easy to apply or we will do it for you if you like. Turn any window into an attention-grabber with your store name, business hours, phone number or logo. Prominently display your company name on your car, shop window or building awning. 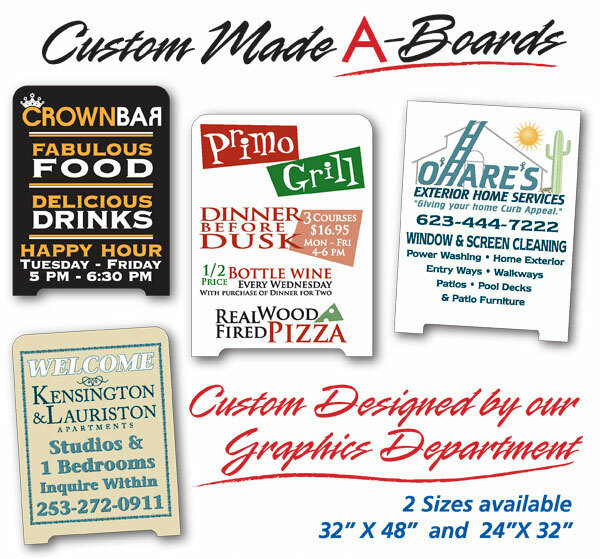 Let our graphic designers help you lay out your vinyl sign! A-Boards (sidewalk signs) are a great way to advertise your business, grab the attention of potential customers walking by or even cars driving by. A-Boards can easily be moved to the most visible locaitons to bring business to your door. Send us your art or let our graphics department design your A-Board sign in-house using your logo and information. A - Board signs are available in two sizes: 32" x 48" and 24" x 32"